Countless observers have noted the obvious fact that the corporate media’s all-encompassing obsession with anti-Russia hysteria is partly just a shameless campaign to prevent change within the Democratic Party by blaming its loss on an outside enemy as opposed to the oligarch-coddling, corrupt disaster it nominated. While true, the strategy is far bigger than that. So called Western elites have failed miserably across the globe, and the only way to retain their undeserved positions of power (many should be in jail), is to create and promote a mindless, highly emotional, non-domenstic distraction. Enter Russia. The problem very quickly became what Integral Metatheory calls a “legitimation crisis,” which it defines as a mismatch between Lower-Left (or cultural) beliefs and the Lower-Right systems (or actual background realities, such as the techno-economic base). The cultural belief was that everybody is created equal, that all people have a perfect and equal right to full personal empowerment, that nobody is intrinsically superior to others (beliefs that flourished with green). Yet the overwhelming reality was increasingly one of a stark and rapidly growing unequality—in terms of income and overall worth, property ownership, employment opportunity, healthcare access, life satisfaction issues. The culture was constantly telling us one thing, and the realities of society were consistently failing to deliver it—the culture was lying. This was a deep and serious legitimation crisis— a culture that is lying to its members simply cannot move forward for long. And if a culture has “no truth,” it has no idea when it’s lying—and thus it naturally lies as many times as it accidentally tells the truth, and hence faster than you can say “deconstruction,” it’s in the midst of a legitimation crisis. Naturally, those in power can never admit their historically epic failure on all fronts, so they’re increasingly rallying around the Russia meme in order to distract the public and hopefully hang on to their plum positions within society. A front-page Times article on Tuesday, citing “fake news” as a threat to Europe, contains what arguably is “fake news” itself by claiming that many of the purported 2,500 stories “discredited” by the European Union’s East Stratcom operation have “links to Russia” although the Times doesn’t identify those links. But it is this mushing together of “fake news” and what the Times describes as “anti-European Union propaganda” that is so insidious. The first relates to consciously fabricated stories; the second involves criticism of a political institution, the E.U,, which is viewed by many Europeans as elitist, remote and disdainful of the needs, interests and attitudes of average citizens. Whether you call such criticism “propaganda” or “dissent,” it is absurd to blame it all on Russia. When it comes to “destabilizing people’s trust in institutions,” the E.U. — especially with its inept handling of the Great Recession and its clumsy response to the Syrian refugee crisis — is doing a bang-up job on its own without Russian help. Yet, rather than face up to legitimate concerns of citizens, the E.U. and U.S. governments have found a convenient scapegoat, Russia. To hammer home this point — to make it the new “groupthink” — E.U. and U.S. leaders have financed propaganda specialists to disparage political criticism by linking it to Russia. There is an Orwellian quality to these schemes — a plan for a kind of Ministry of Truth enforced by algorithms to weed out deviant ideas — but almost no one whose voice is allowed in the mass media gets to make that observation. Even now, there is a chilling uniformity in the endless denunciations of Russia as the root of all evil. Though the Times’ article treats the E.U.’s East Stratcom operatives as 11 beleaguered public servants sticking their fingers in the dike to protect the citizenry from a flood of Russian disinformation, “stratcom” actually is a euphemism for psychological operations, i.e., the strategic use of communications to influence the thinking of a target population. In this case, the target populations are the European public and – to an ancillary degree – the American people who get to absorb the same propaganda from The New York Times. The real goal of stratcom is not to combat a few sleazy entrepreneurs generating consciously false stories for profit but to silence or “discredit” sources of information that question the E.U. and U.S. propaganda. In other words, the West’s stratcom and “psychological operations” are swimming in dough despite the Times’ representation that these “anti-disinformation” projects are unfairly outgunned by sinister forces daring to challenge what everyone-in-the-know knows to be true. If these “stratcom” operations were around in 2002-2003, they would have been accusing the few people questioning the Iraq-has-WMD certainty of putting out “fake news” to benefit Saddam Hussein. Now, journalists and citizens who don’t buy the full-Monte demonization of Russia and its President Vladimir Putin are put into a similar category. Disturbingly, the leading forces in this suppression of skepticism are the most prestigious newspapers in the United States and Europe. Even after the disastrous experience with the Iraq War and the bogus WMD groupthink, Western news outlets that were party to that fiasco have virtually excluded well-reported articles and documentaries that question the U.S. and E.U. narratives of the New Cold War. For instance, there has been almost no presentation in the mainstream Western media of an alternative – and I would argue more complete and accurate – narrative of the Ukraine conflict, taking into account the country’s complex history and deep ethnic divisions. It is essentially forbidden to refer to the violent overthrow of elected President Viktor Yanukovych three years ago as a “coup” or a “putsch” or to cite evidence of a U.S.-backed “regime change,” such as an intercepted phone call between U.S. Assistant Secretary of State Victoria Nuland and U.S. Ambassador to Ukraine Geoffrey Pyatt in which they discussed how “to glue” and how “to midwife” the installation of a new leadership in Kiev. In the supposedly “free” West, you can only refer to the post-coup events in Crimea, in which the people of the largely ethnic Russia area voted overwhelmingly to secede from Ukraine and rejoin Russia, as a “Russian invasion.” No skepticism is allowed even though there were no images of Russian troops wading ashore on Crimea’s beaches or Russian tanks crashing across borders. The “invasion” supposedly happened even though no invasion was necessary because Russian troops were already in Crimea under the naval basing agreement at Sevastopol. Amid the West’s current hysteria about “Russian propaganda,” U.S. and E.U. citizens are not even given the opportunity to watch well-reported documentaries about key moments in the New Cold War, including an eye-opening investigative report debunking the Western propaganda myth constructed around the death of Russian accountant Sergei Magnitsky or a well-produced historical account of the Ukraine crisis. Western news outlets and governments even take pride in blocking such dissenting views and contrary information from reaching the American and European publics. Like East Stratcom — the E.U.’s Brussels-based 11-member team of diplomats, bureaucrats and former journalists — establishment institutions see themselves bravely battling “Russian disinformation.” They see it as their duty not to let their people hear this other side of the story. There is an Orwellian quality to these schemes — a plan for a kind of Ministry of Truth enforced by algorithms to weed out deviant ideas — but almost no one whose voice is allowed in the mass media gets to make that observation. Algorithms are often elegant and incredibly useful tools used to accomplish tasks. They are mostly invisible aids, augmenting human lives in increasingly incredible ways. However, sometimes the application of algorithms created with good intentions leads to unintended consequences. The use of algorithms is spreading as massive amounts of data are being created, captured and analyzed by businesses and governments. Some are calling this the Age of Algorithms and predicting that the future of algorithms is tied to machine learning and deep learningthat will get better and better at an ever-faster pace. Finally, here’s an important quote highlighting some of what needs to be done in order to ensure algorithms work for us, as opposed to against us. 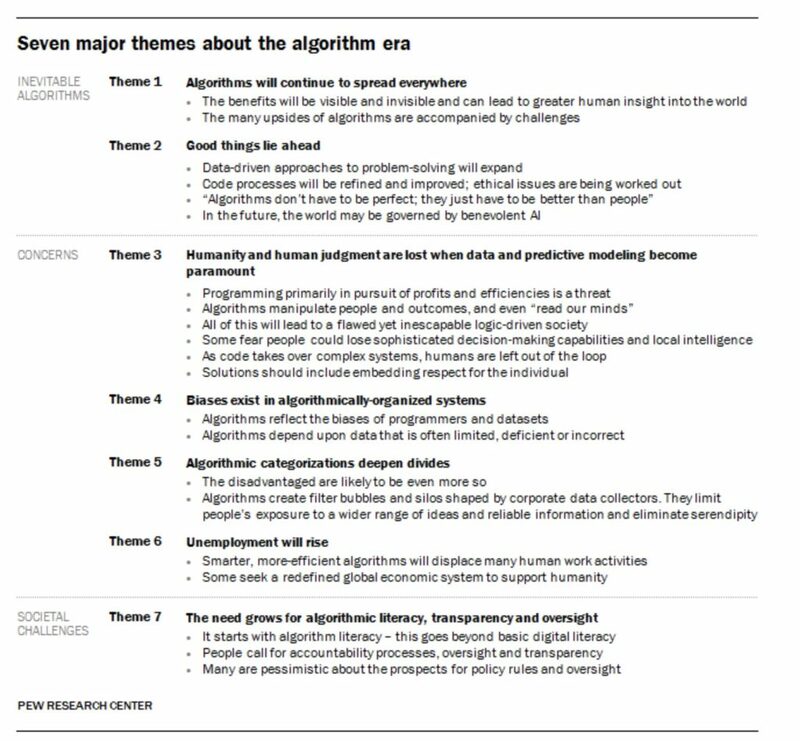 To create oversight that would assess the impact of algorithms, first we need to see and understand them in the context for which they were developed. That, by itself, is a tall order that requires impartial experts backtracking through the technology development process to find the models and formulae that originated the algorithms. Then, keeping all that learning at hand, the experts need to soberly assess the benefits and deficits or risks the algorithms create. Who is prepared to do this? Who has the time, the budget and resources to investigate and recommend useful courses of action? This is a 21st-century job description – and market niche – in search of real people and companies. In order to make algorithms more transparent, products and product information circulars might include an outline of algorithmic assumptions, akin to the nutritional sidebar now found on many packaged food products, that would inform users of how algorithms drive intelligence in a given product and a reasonable outline of the implications inherent in those assumptions. If you enjoyed this post, and want to contribute to genuine, independent media, consider visiting Liberty Blitzkrieg's Support Page.